How to Order the 2nd Edition. Order direct from the publisher, Guilford Press (print and e-book), or at your favorite online bookseller, including Apple, Amazon, Barnes & Noble, eBooks.com, and Google Play Books. Kindle [Print Replica] Advisement: For screens less than 8 inches, we do not recommend the Amazon Kindle [Print Replica] format. Click HERE for important information about Kindle [Print Replica] format and compatibility with your device. Are you a ​Professor in the USA or Canada? 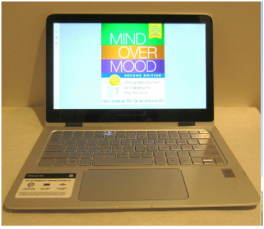 Want to consider Mind Over Mood (2nd edition) for course adoption? ​To request a 60-day exam copy, visit Guilford Press (https://www.guilford.com/professors). For the English version, enter ISBN number 9781462520428. For the Spanish version, enter ISBN 9781462527908. For professor evaluation purposes only. Guilford requires an institutional shipping address and contact information for all exam copy requests. The full price of the exam copy will be due after 60 days unless returned or adopted. You can buy the e-book and get the print format for only 10% more. That's a savings of 45% off the list price for both formats. Currently E-Book + Print Book = $29.64 USD when you buy directly from the Publisher. Sales tax is charged on all orders from Canada (GST 5%), California (7.25%), New York (varies), and Pennsylvania (6%). Please note: no returns or refunds on e-books. The New 2nd Edition of the Mind Over Mood workbook (MOM2) (2016) was actually published on October 15, 2015. It has expanded content, new chapters and over 60 worksheets. Already Have the First Edition? The Publisher has a page of Frequently Asked Questions that you may find useful. If you own a 1st edition, be assured that all the information, exercises and worksheets are still good. Photo credits: 2015 Copyright MindOverMood.com. All rights reserved. ​The Print Replica format does not function well on screens less than 8 inches. ​And, the Print Replica format CANNOT be loaded on any of the Kindle paperwhites and other e-ink models. Text is in a fixed format and does not re-flow like it would with normal Kindle formatting. The print replica format is designed to preserve all the features of the print edition. According to Amazon: "Print Replica Kindle books maintain the rich formatting and layout of their related print editions and offer many of the advantages of standard Kindle books. Features include: Notes and highlights, Search, copy and paste, Zoom and pan, Pop-out linked table-of-contents, Page numbers matching print edition. ​BEFORE BUYING, VERIFY COMPATIBILITY. Go to the kindle product page, click on the drop down list titled: "Available only on these devices"